This is a book about death, loss, grief and mourning, but with an unusual twist. It is different in that it explores specific kinds of deaths encountered within families and households, rather than general concepts of mourning. 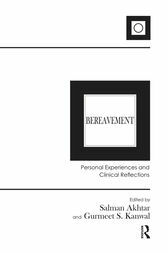 It is even more unusual because here six psychoanalysts reveal how they have suffered, processed, and survived losses in their own lives; at the same time bringing clinical and theoretical perspectives of various psychoanalytic schools to bear on their own, as well as others', experiences. The narratives in this book use the power of subjective experience, as described by psychoanalysts themselves, to understand, contextualize, and extend existing clinical approaches. Each chapter addresses the death of a different loved one. The losses discussed include death of a mother, death of a father, death of a sibling, death of a spouse, death of a child, and death of a pet (recognizing the deep significance of pets in human households).